Business is a little slow for this street vendor in San Francisco. I think he was more interested in reading his messages on his phone. Love the way the colours stood out against the white walls. Looks like he's being paid by the hour. He got an order through SMS. i think he's only reading it when he has nothing better to do with his time. Lina: You're right. All luck to see something like that. Ryan: Paid by the hour and no rush to finish work early! Rainfield61: So clever! Must be a high-tech vendor to get business that way. Life Ramblings: Killing time, but not too interested in getting a sale. 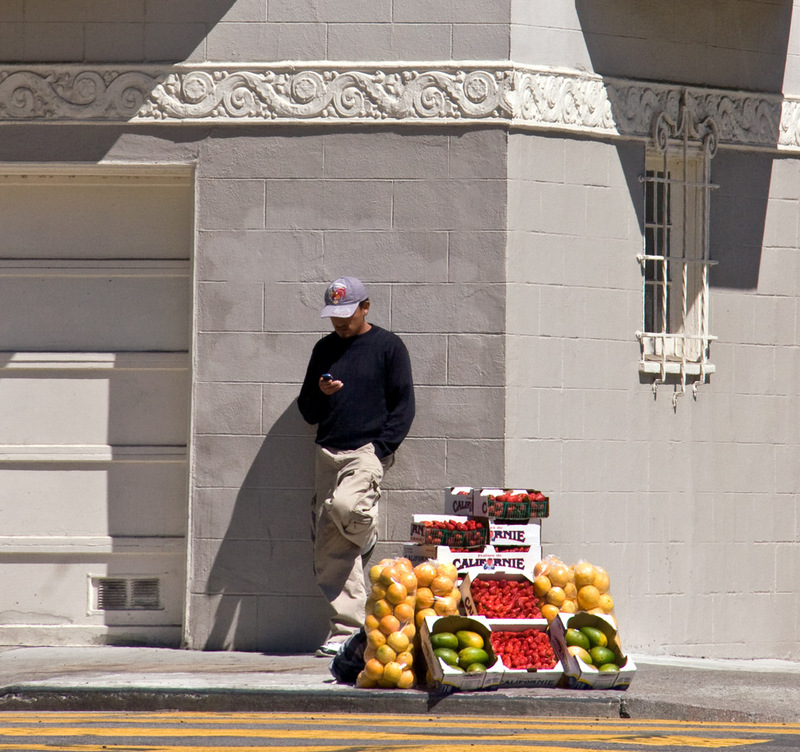 Poetic Shutterbug: Entrepreneurship is live and well in SF. Betchai: Thanks! I hope his SMS orders are local so he doesn't have to ship them too far. Oh dear, it can't be an easy trade to be in!! How often must cars speed on by, heading for more air-conditioned places?